The second Figure and Tile Collection brings pieces to Second Edition from both first edition expansions,Forbidden Alchemy and Call of the Wild. 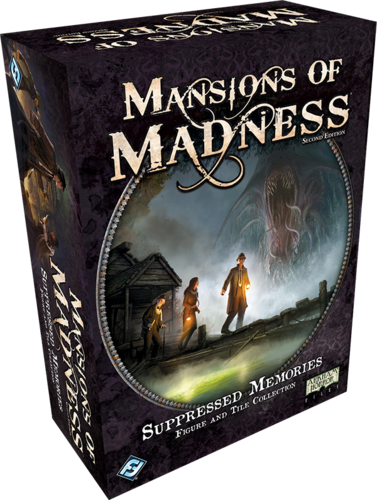 Suppressed Memories includes eight investigators, fifteen plastic monster miniatures, and seventeen double-sided map tiles. You may choose to play as Bob Jenkins, the charismatic salesman from Call of the Wild, or the insightful psychologist Carolyn Fern from Forbidden Alchemy. Consider your investigators carefully, because it will take exceptional strength and will to escape a threatening Byakhee or an unsettling Nightgaunt. More info at the Publisher's website.